England continue their preparations for the 2018 World Cup when they host world champions, Germany. England continue their preparations for the 2018 World Cup when they host world champions, Germany, at Wembley Stadium on Friday. It’s just a friendly, so this will be the perfect opportunity for either manager to experiment with their line-ups and tamper with their squads. The last time these two sides met, Lukas Podolski ended his international career with a stunning strike to claim a 1-0 win at Wembley for the Germans. That stretched the Three Lions’ winless run on home soil against Germany, dating back to 1975. After qualifying into the 2018 FIFA World Cup, England continue their preparations for Russia with two mouth-watering fixtures against Germany and Brazil. They’ll have to face both giants without Tottenham trio, Harry Kane, Dele Alli and Harry Winks, who all pulled out of the squad through injury. Apart from the abovementioned Spurs players, Gareth Southgate has left out a number of big names for the latest friendlies. Southgate left out Alex Oxlade-Chamberlain, Daniel Sturridge and Chris Smalling, all of whom have loads of international experience – exactly what you need when facing the world number one ranked team. That paved the way for Tammy Abraham, Joe Gomez and Ruben Loftus-Cheek to receive their first senior call-ups for the Three Lions. England, despite not having the fiercest firepower up front, have some great defenders, most notably in Gary Cahill, Phil Jones and John Stones – who has been a key figure in Pep Guardiola’s Manchester City system in playing out from the back. They haven’t beaten Germany on home soil since 1975 and they will need to be extremely tight in defence and use the pace of Jamie Vardy or Marcus Rashford to catch the world champions on the counter. Since their semi-final defeat to France in the 2016 Euro’s, Joachim Low’s men have gone 19 games undefeated, winning the Confederations Cup and qualifying for the 2018 FIFA World Cup, winning all 10 of their qualifying matches. 2014 FIFA World Cup hero, Mario Gotze, has been recalled to the national team along with Ilkay Gundogan, who both missed a large part of 2017 through injury. The Bayern Munich pair of Thomas Muller and Manuel Neuer have missed out this time around, but Die Mannschaft have plenty of quality players worthy of replacing them. Germany have arguably the best international manager in Low. He’s a master tactician and was actually the first manager in world football to counter the 3-4-3 formation with a 3-4-3 of his own. I expect that he will do the same against England, with a Bavarian centre-back partnership of Jerome Boateng, Mats Hummels and Niklas Sule. 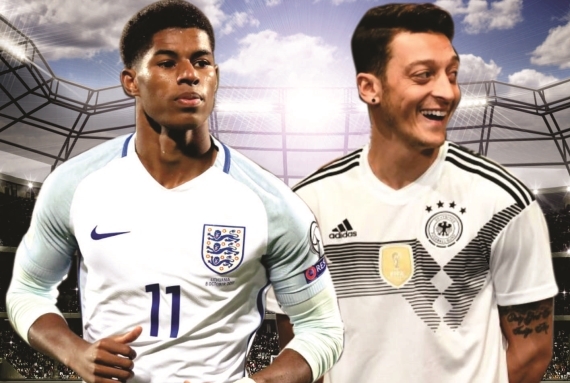 Mesut Ozil and Toni Kroos are both known for their impressive ability to pick out a pass, and with players like Leroy Sane and Julian Draxler making a run down the channels on the wing, Germany make it look easy to unlock the opposition defence. With some of the most high-profile names in international football all in the midfield, Gotze is likely to play as a false striker – a formula that won the Germans a FIFA World Cup. Defenders: Jerome Boateng (Bayern Munich), Matthias Ginter (Borussia Monchengladbach), Marcel Halstenberg (Leipzig), Mats Hummels (Bayern Munich), Joshua Kimmich (Bayern Munich), Marvin Plattenhardt (Hertha Berlin), Antonio Rudiger (Chelsea), Niklas Sule (Bayern Munich). Germany come into this fixture high in confidence after qualifying for the 2018 World Cup with a 100% record. They have a brilliant record away to England and with players like Kroos, Ozil, Sane and Gotze, the world champions should come out on top.